What were it's pre-orders like? Not sure why people on the front page are disappointed in Ar nosurge's sales on Vita. Yeah, they're low, but so was the original release on PS3. Last time we got an update it was around 40k. SE should of really put it on PS4 as well. Its going to take a notable hit in the West now. Every PS4 game requires a PSN release. No retail KH game has been released digitally, including 2.5 HD Remix on PS3. KH3 ain't coming out this century so they'll have plenty of time to get things in order for that. 15 million PS4 is conservative. I was going to make that joke, haha. The mobile space in Japan is obviously much healthier than the console space, but I now find myself curious what degree of relevance it holds in the global market as well. PazuDora is probably the most notable success. And it ranks among top grossing apps like Clash of Clans and Candy Crush. But I've no doubt they draw their success beyond Finland and the UK. Does it draw a following beyond the immediate locality? If it goes like with FFXIII next december seems to be their target. I thought the FFXV demo was confirmed to be available at a later date? Like how the RE6 demo in Dragon's Dogma wasn't available immediately. As a question, do you mean beyond Japan or beyond Eastern Asia? The question came to mind with the discussion above about Japan's relevance in the global gaming market. Google did partially answer my question though, in that it apparently has had 7M downloads overseas but GungHo still makes almost all its revenue locally. We have no idea when the demo is releasing. Brave Frontier is at 46 (though it gets higher), Star Wars Force Collection at 67, Marvel War of Heroes at 69, and P&D at 98. To my understanding, in countries like South Korea, China, Taiwan, and Malaysia they have more luck. I'll see if I can confirm that. Gumi handles Brave Frontier in the US which is why so many Japanese publishers are signing with them for localization. Okay as a follow up, what I said seems to hold true except possibly with China. Thanks for the list. Brave Frontier has a pretty good placement, but without a strong Western brand to hitch to there doesn't seem like much Japanese presence in the US top grossers it seems. So I don't know if the strong local mobile market necessarily amounts to global mindshare and relevance. Unless other big titles are schedule for 2015, PS4 install base probably will be low for a main Final Fantasy debut. Yeah, but that'll be true no matter when they release. It'd be better to launch during the holidays, when a larger audience might splurge for a whole console just to play your game. Just to note, you're looking at overall apps. Here's the games specific chart for iOS and for Android. There used to even be titles like Rage of Bahamut at #2 in the US chart, but as more Western developers and advertising money rolled in, they started to fall out of the charts. It's actually kind of similar to what happened on consoles. Hmm, running counter to my previous thought. I found this somewhat old article, which would suggest that dominating the local Japanese mobile market does in a sense provide global relevance, considering the Japanese market apparently accounts for more than a quarter of global mobile gaming revenue as at December last year and roughly equivalent to the US market. Not sure if that's changed much over the last ten months though. Btw, what exactly happened to that Fatal Frame movie. I haven't been able to find any news about it, the manga, etc. and how they're performing. The comic is up on DeNA's Manga Box app in Japanese and English. 10 chapters have been published so far. Is Media Create more reputable/accurate than Famitsu sales? When will release the new 3ds in jap & monster hunters 4? So, can we expect more than 1,25 million for Monster Hunter 4G next week? One advance Japan has is that user acquisition to ARPU is way more favorable in Japan than anywhere else too. Is the white PS4 becoming standard in japan? Looks like they're selling this starting tomorrow (without Destiny?). 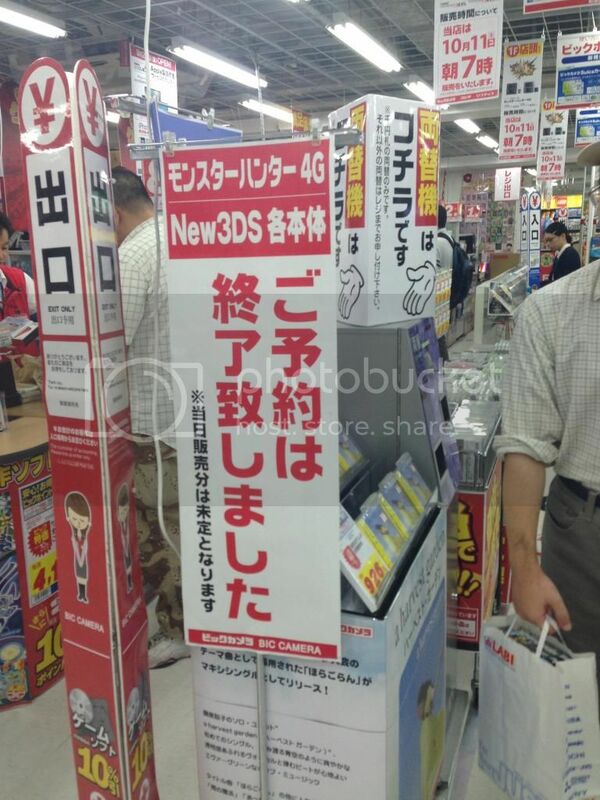 Pre-orders for Monster Hunter 4G and New 3DS are already closed in Bic Camera and Yodabashi Camera. Shops will open at 7:00 a.m. on Saturday because long queues are expected. Usually they open at 10:00 a.m.
For Super Smash Bros for 3DS shops opened at 8:30-9:00 a.m.
MH4G and the revisions are surely going to keep retailers busy this weekend. Its confirmed to come with Type 0 in March. Called episode Duscae iirc. Yep, it went on sale today. That video is cool, showing all the big titles coming to PS4 next year. I hope it's also gonna be on TV. Edit: lol, somebody did a Wii U version (they forgot the lego game). any comgnet preorder comparison for MH4G with MH4, MH3G, YW2 and Smash 3DS? So many good Japanese games in that advert. Wonder why they showed FFXV but not KH3? Not suprised by the WiiU one. Iirc not a single WiiU game was announced around TGS. 'Ello 'ello. Was surprised this didn't show up last week actually. Ninty and Bamco holding those position like a Boss. Well all of them are 2015 games except GTAVHD, and KH3 clearly isn't a 2015 game. It is for me too. I wonder why they changed it? Well I'll be damned, Xbox 1 hanging in there above 1k for longer than I thought. And PS4 got dreamcasted lol. 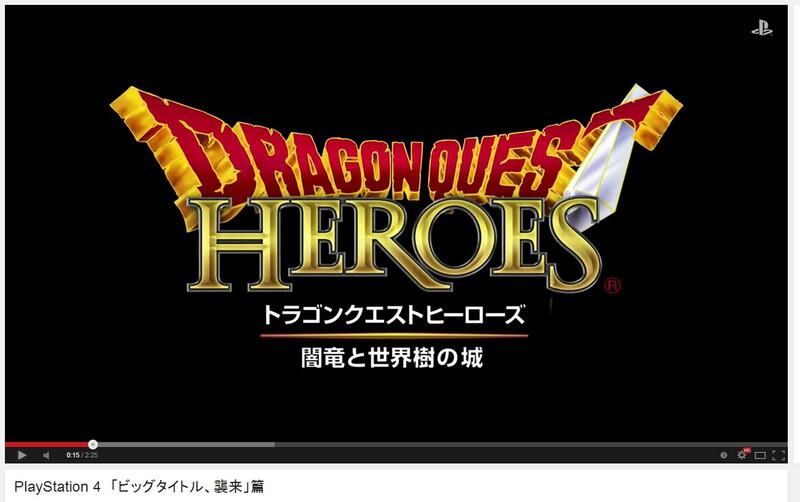 Looks like the editor erased the ten-ten on the &#12480; on the logo down the bottom, so it says Tragon Quest instead of Dragon Quest. LMAO. First Dargon Quest, now Tragon Quest. RIP Capcom. Guess that's what happens when you don't really release games and focus on mobile I guess. Edit: Also shouldn't Atlus be with Sega? Yeah but isnt just the code, that you can redeem later in the year. I guess that's what happens when you don't release Monster Hunter. And when you don't have a Monster Hunter game released maybe hum ? Oh, counting on ya for line pics! I dont know where to go, though. I was thinking to go to Shibuya in front Tsutaya's store. But I guess Shinjuku Bic Camera will be busy too (the last video I took with the huge line for Smash Bros was there). I have my pre-order in GamesMaya, is very far from my house, and I'm not gonna line there. I already told the boss I will go to pick up my New 3DS the following day. After the rush.